MultiDyne, a leading provider of fiber-optic-based video and audio transport solutions for broadcast and pro A/V applications, today announced that Emmy-award winning mobile television production company TNDV has chosen MultiDyne and the SMPTE-HUT universal camera transceiver to simplify fiber transport and improve signal integrity for live and recorded productions. Designed to extend transmission distances of HD cameras limited by hybrid copper/fiber cable up to 10km using two single-mode fibers, the MultiDyne SMPTE-HUT provides TNDV with increased flexibility, ease of use, and time savings, while lowering operational expenses. TNDV is using SMPTE-HUT on its HD production trucks to support a variety of applications, including live sports, broadcast entertainment specials, and corporate events. Leveraging the high-performance camera transport system, TNDV camera operators now rely on far less cables at remote production locations. 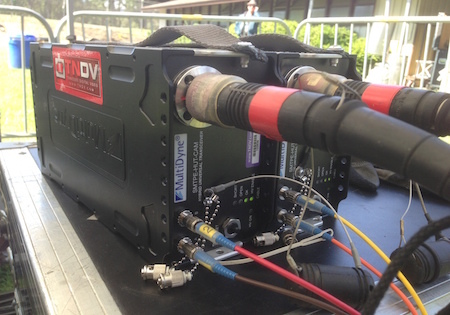 For example, prior to deploying SMPTE-HUT, TNDV would typically use ten 1,000ft cables for a 10-camera production. With SMPTE-HUT, the production company can use a single tactical fiber connection, or two at most, resulting in substantial savings in terms of time, money, and weight involved with having to carry multiple hybrid cables. In addition, SMPTE-HUT seamlessly reduces RD, EMI, and grounding issues, maximizing reliability in the field. Featuring a rugged design that is ideal for withstanding harsh broadcasting environments, the SMPTE-HUT can be used as both a passive, unpowered system or as a powered system. Extremely lightweight, flexible, and versatile, the camera transceiver supports a wide range of HD camera models, including those by Sony, Ikegami, Grass Valley, and Panasonic, providing TNDV with a single solution for all of its fiber transport needs. Operators can customize the SMPTE-HUT system by choosing optical or hybrid connectors that best match their specific requirements.